The Arms Reach Cocoon is a baby bed that continues the feeling of the womb. It cradles your baby closely and sways gently, mimicking the motion experienced by babies during the nine months of pregnancy. 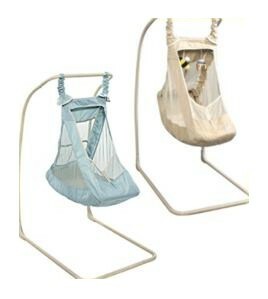 The cocoon swings in response to your baby every time he stirs in his sleep giving him the security he needs during his transition into our world. The Beautiful Dreamer Cocoon is small enough to fit right next to your bed within arm's reach, so your baby won't have to sleep alone in the baby nursery. If your baby stirs during the night, you can bounce the cocoon to comfort him back to sleep without sacrificing the warmth of your own bed. This timely response to your baby's needs enhances the security provided by the cocoon. You can lift baby into your bed for feeding at night without having to get out of bed - no-one likes cold toes in winter, especially in the middle of the night! The cocoon can be moved easily around the house so you can place it in a convenient spot for you to watch your baby during daytime naps - great peace of mind for a stressed out new mom. And because the cocoon encourages longer nap times, maybe you can catch a few minutes of much needed sleep too! Baby gets the benefit of spending the night cocooned in a snug, cozy environment. This provides your baby with the security he or she needs during the early months of emotional development. Colicky babies are comforted by the womb-like movement of the cocoon. The bouncing movement soothes stomach cramps and gas pains in that little tummy and improves digestion. The pain of acid reflux is also eased in the Beautiful Dreamer Cocoon. Adjusting the back to the most comfortable angle for your baby reduces the pain, and the swaying movement encourages your baby to fall back to sleep. Restless sleepers tend to have more peaceful nights, due to the automatic swaying of the bed in response to your baby's movement. It's as if your arms are right there rocking her back to sleep. The small, cocoon-like environment of the Beautiful Dreamer is perfect for prem babies. Premmies often crave the closeness and motion experienced in the womb. Placing your baby in the Arms Reach Cocoon gives your arms a break for a while. The cocoon naturally stimulates and entertains little ones during the waking hours. Babies learn to control the sway of this little baby bed with their body movements encouraging physical activity and bringing them great satisfaction! You can incline the back so that your baby has a view of the world too. The Beautiful Dreamer is recommended by physicians. In the upright position the hammock decreases the head-flattening effect associated with laying babies on their backs. Research has shown that babies sleeping in the parents' room for the first year are at less risk of SIDS. Note that this does not apply to babies sleeping in the parents' bed, which has been associated with an increased SIDS risk. Placing the cocoon next to your bed gives you the peace of mind that comes with knowing that you are doing the best for your baby. Read more about SIDS prevention here. Is fully portable and disassembles easily for travel, so you can take your baby's favorite place with you wherever you go. Takes 10 minutes to assemble. This little baby bed comes in various styles. Choose the one that best fits with your bedroom or baby nursery decor. The only down-side is that this sleeping nest is temporary. It has a weight limit of 23lbs, and is recommended for use from newborn until your baby reaches the maximum weight. When your baby reaches 23lbs in weight, he or she will have to be moved to a more permanent baby crib in the baby nursery, or you could consider cosleeping as an option. The Arms reach Beautiful Dreamer Cocoon has overwhelming benefits for your baby and is well worth the small investment. The security and comfort you will be giving to your vulnerable newborn miracle are priceless.